RICCI Rivero turned tears to cheers on an emotion-filled Wednesday afternoon, shaking off foul trouble to lead a big La Salle comeback over Ateneo, 92-83, and extend the UAAP Season 80 Finals to a deciding Game Three. 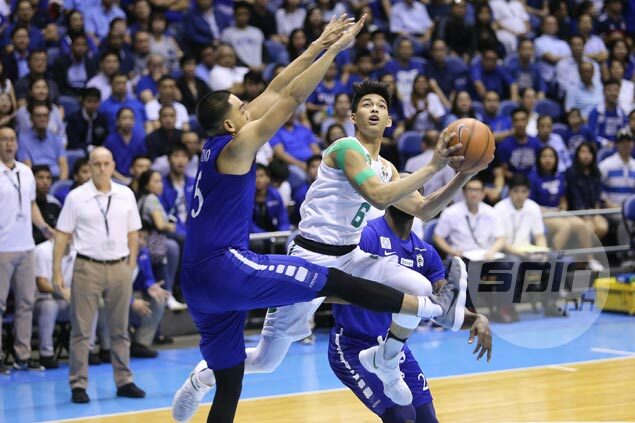 Reduced to tears after being called for his fourth foul with still over two minutes left in the second quarter, the high-flying Rivero regained his composure to spark a 26-8 third quarter that enabled the Green Archers to wipe out a 21-point deficit. La Salle turned the momentum completely from there before a stunned crowd at the Smart Araneta Coliseum, setting the stage for a winner-take-all Game Three on Sunday, also at the Big Dome. Ben Mbala had 20 points, 16 rebounds, and four blocks while Rivero added 18 points, including eight in that epic third quarter that enabled the Green Archers to open a 13-point lead - a 34-point turnaround from the first period. Andrei Caracut also came up big for the Green Archers, scoring 10 of his 13 points in the second half. Aljun Melecio contributed 12 points, six coming in the fourth canto. Anton Asistio led Ateneo’s first-half attack as he scored 13 points while knocking down four of five attempts from three-point land. But Asistio went scoreless while held to one attempt in the entire second half. Thirdy Ravena got 20 points, six rebounds, and four assists while Aaron Black scored 15 points while providing the lone bright spot for the Blue Eagles in the second half. Game Two was not without a commotion as Ateneo coach Tab Baldwin was seen in a shouting match with a La Salle supporter at the end of the contest. After shooting 48 percent from the field in the first half, Ateneo shot only 14-of-40 from the field in the next two quarters. In contrast, La Salle went 16-of-28 in the second half. Things looked bleak for La Salle's defending champions after they trailed, 49-28, in the second quarter while plagued by foul trouble to key players Rivero and Mbala, who was slapped with two fouls before halftime. But the Green Archers ended the first half with 10 straight points to slice the gap to nine points, 51-42, at halftime then went into overdrive in the third quarter behind the scoring wizardry of Rivero. Ateneo fired blanks in the third period, scoring only eight points in that fateful stretch. After being down by nine, 56-47, Rivero finally tied the game at 58, before Mbala gave La Salle a 60-58 lead. Rivero converted another lay-up, 62-58, and the Green Archers never trailed after that. DLSU 92 - Mbala 20, Ri. Rivero 18, Caracut 13, Melecio 12, Montalbo 9, Santillan 8, P. Rivero 8, Tratter 4, Tero 0, Go 0, Baltazar 0. Ateneo 83 - Ravena 20, Black 15, Asistio 13, Go 11, Ma. Nieto 10, Ikeh 6, Mendoza 5, Tolentino 2, Tio 1, Verano 0, Mi. Nieto 0, Mamuyac 0, Porter 0. Quarterscores: 15-32, 42-51, 68-59, 92-83.